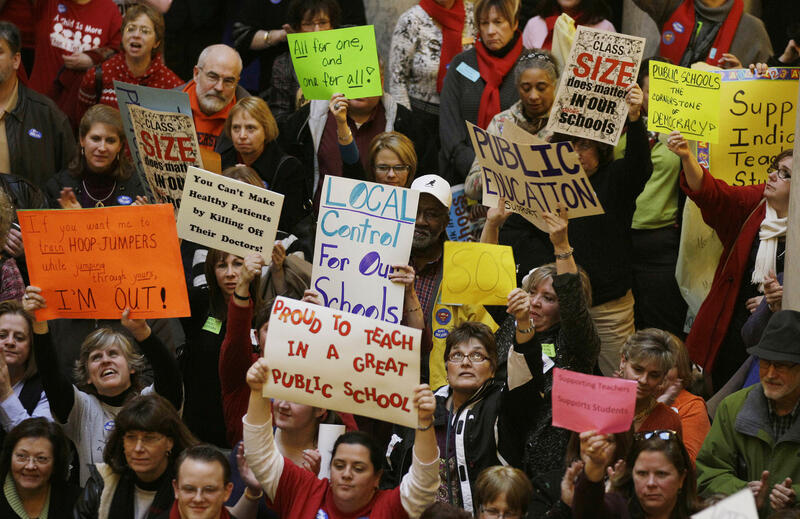 Teachers rallied at the Statehouse in Indianapolis in 2011 to protest Gov. Mitch Daniels' attempts to curb collective bargaining, implement merit pay and create a voucher system that would send taxpayer money to private schools. Pauline Massy (left) attended a crowded public high school and wanted something more intimate for her daughter, Kayla Massy-Charles. Kayla's now a junior at a small, Catholic school. "The intent of the program was to give parents choice," says state Rep. Robert Behning. Parents of children in private schools, he says, "are taxpayers just like the parents in a traditional public school." 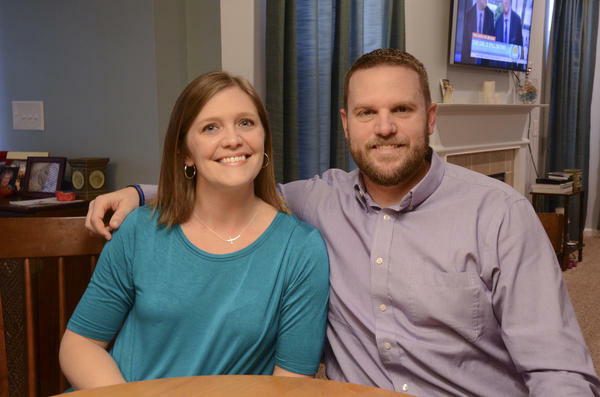 Carol and Mark Crawn have a 12-year-old daughter who is on the autism spectrum. 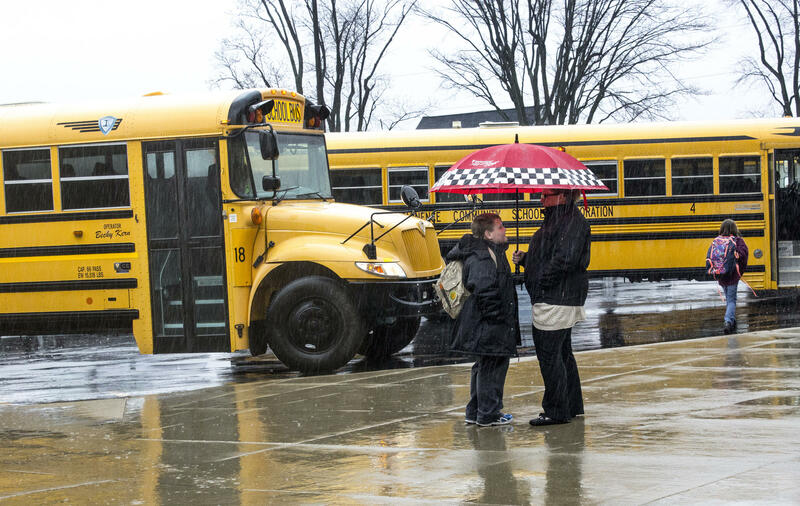 Eminence Jr.-Sr. High School Principal Corey Scott (right) chats with a student in the rain at the end of the day. 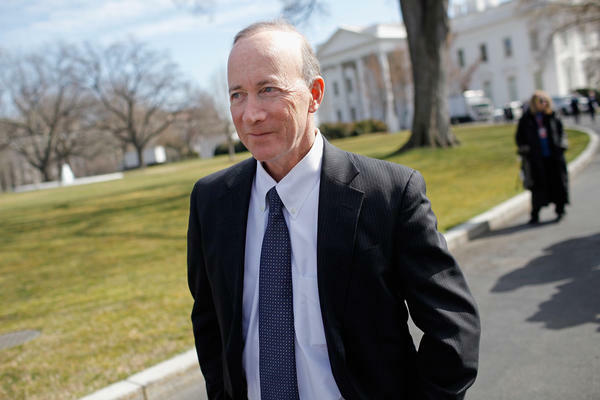 Mitch Daniels, shown leaving the White House after a meeting in 2012, was governor of Indiana in 2011 when the state adopted its voucher program. These days he's the president of Purdue University. Fort Wayne's superintendent of public schools, Wendy Robinson, is not afraid of competition from private schools. Fort Wayne, Ind., is known as the "City of Churches." The city is home to more than 350 churches, many of which also run their own schools. Roncalli High, a Catholic school in Indianapolis, has a campus that includes a fine arts building and a gleaming stadium for its football team, the Rebels. 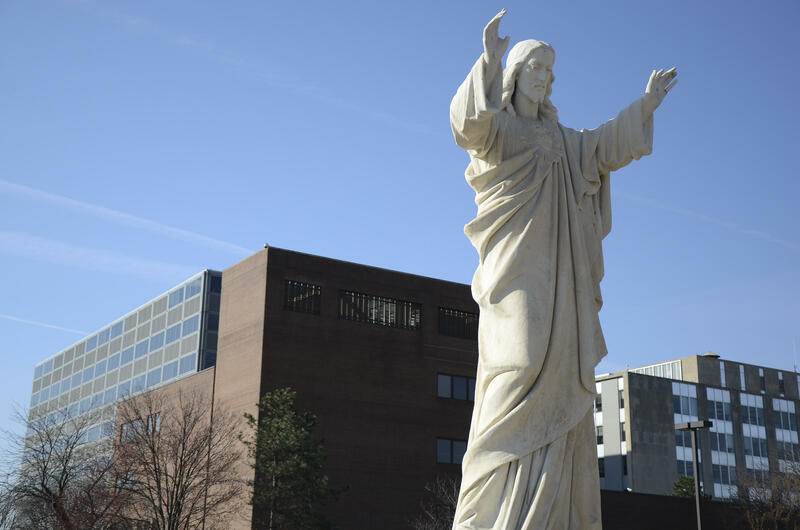 A statue of Jesus watches over Fort Wayne. Behind it: the offices of Fort Wayne Community Schools. Trophy cases line the halls at Eminence Jr.-Sr. High School, a public school where enrollment has been dropping. Eminence is too small to field a football team. 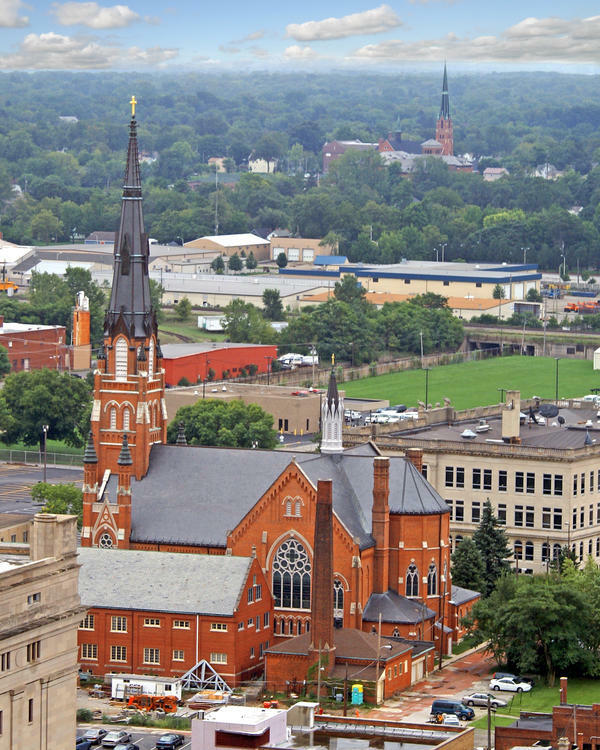 Steeples dominate the skyline of Fort Wayne, Ind. Here's an aerial view of downtown. Wendy Robinson wants to make one thing very clear. As the long-serving superintendent of Fort Wayne public schools, Indiana's largest district, she is not afraid of competition from private schools. "We've been talking choice in this community and in this school system for almost 40 years," Robinson says. Her downtown office sits in the shadow of the city's grand, Civil War-era Cathedral of the Immaculate Conception. In Fort Wayne, a parking lot is the only thing that separates the beating heart of Catholic life from the brains of the city's public schools. In fact, steeples dominate the skyline of the so-called City of Churches. Fort Wayne has long been a vibrant religious hub, home to more than 350 churches, many of which also run their own schools. While the city's public and private schools managed, for decades, to co-exist amicably, that changed in 2011, Robinson says. 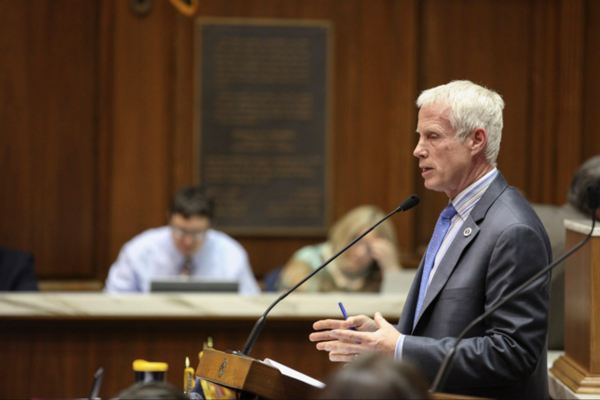 That's when state lawmakers began the Indiana Choice Scholarship Program, a plan to allow low-income students to use vouchers, paid for with public school dollars, to attend private, generally religious schools. Six years later, Indiana's statewide voucher program is now the largest of its kind in the country and, with President Trump and Education Secretary Betsy DeVos openly encouraging states to embrace private school choice, the story of the Choice Scholarship — how it came to be, how it works and whom it serves — has become a national story of freedom, faith, poverty and politics. Our story begins in Fort Wayne, where the state now spends $20 million a year on voucher students, more than in any other district. This year, $1.1 million of that $20 million went to one private, K-8 school: St. Jude Catholic School. St. Jude opened its school doors in March of 1929. By 2011, when the state unveiled its voucher program, the school enrolled 479 students. That first year, a small number received vouchers: just 28. Then something happened to the program that began a remarkable shift, not only at St. Jude but across the state. Father Jake Runyon saw it happening and told his parishioners. "We've been seeing some financial troubles here at St. Jude Parish," Runyon said in a formal presentation that was recorded in 2014 and posted on the church's website. 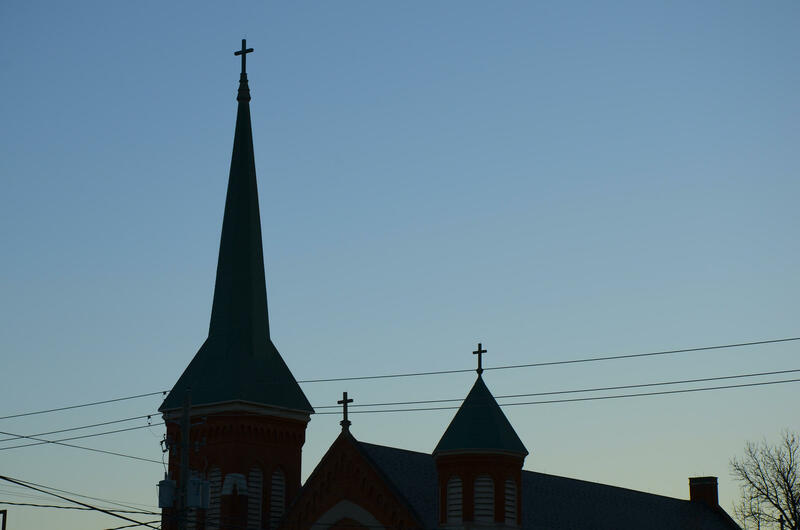 The parish was in its third straight year of financial losses. One big reason for the losses: The church was pouring money from its offertory into the school and neglecting repairs to its steeple and cooling system. Then, Runyon shared the good news: After an attempt by the state teachers union to kill the young voucher program, Indiana's Supreme Court had found it constitutional, allowing families to spend public school dollars in private, religious schools. Not long after, the program was expanded dramatically to include children who had never attended a public school. Suddenly, many St. Jude students qualified. All they had to do was apply. "The effect on that this year," Runyon told parishioners in 2014, "it would have been $118,000 of money we just left there, that the state of Indiana wanted to give me, and we weren't able to take advantage of it." Runyon's presentation — since taken down from the church's website — was a pitch for a new way of distributing financial aid to St. Jude students, one that would maximize the money coming in through vouchers and allow the parish to use more of its offertory elsewhere. When word of the plan reached beyond St. Jude, though, it appeared to confirm the greatest fears of public school advocates: that vouchers were a giveaway to the state's cash-strapped religious schools at the expense of struggling public schools. This year, according to state data, nearly two-thirds of St. Jude's students now receive public dollars to help pay for their private school tuition. Runyon, who is still Pastor at St. Jude, declined repeated interview requests. "Social justice has come to Indiana education," Gov. Mitch Daniels said in 2011 after the state made several big changes to its education system. Among those changes was the new voucher program, capped at 7,500 children, to allow low-income students to use state education dollars to attend private schools. "The ability to choose a school that a parent believes is best for their child's future is no longer limited to the wealthy." Of the children in that first voucher class, 2011-2012, most had two things in common: They were low-income and had attended public school. "Public schools will get first shot at every child," Daniels said back then in a speech to the conservative-leaning American Enterprise Institute. "If the public school delivers and succeeds, no one will seek to exercise this choice." Daniels, who is now the president of Purdue University, predicted that the voucher program was "not likely to be a very large phenomenon in Indiana." In 2013, Mike Pence succeeded Daniels as Indiana's governor, and, within months, the now-vice president oversaw a dramatic expansion of the program. Lawmakers added new pathways for students to qualify, making the voucher more accessible to children who had never attended a public school. They also expanded the program's reach to include some middle-class families. Voucher enrollment doubled in one year. "It's actually grown almost exponentially as you look at the numbers," says the law's proud architect, state Rep. Robert Behning, a Republican. It's also popular, according to a 2016 survey conducted by EdChoice, a group that advocates for vouchers and other forms of school choice. Today, more than 34,000 students are enrolled in Indiana's Choice Scholarship Program — 3 percent of students statewide. To qualify, parents have to meet certain income limits. For a full voucher, worth 90 percent of what a state would spend in a public school, a family of four can earn no more than $45,000 annually, but students whose parents earn up to $67,000 can still qualify for a half-voucher. And for children already in the program, their family income can rise to nearly $90,000 annually. The biggest headline from the program's growth is this: Today, more than half of all voucher students in the state have no record of attending a public school. 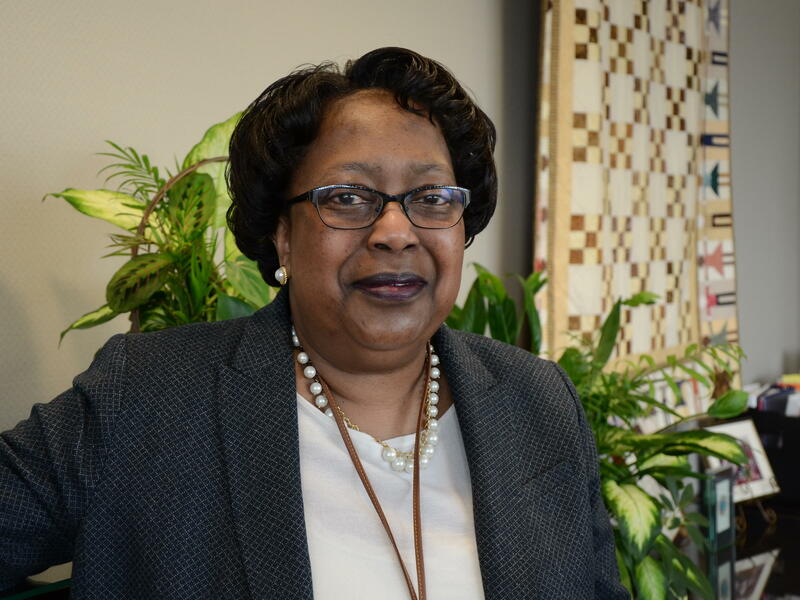 "We're not losing kids from our schools [to vouchers]," says Superintendent Wendy Robinson. "We're now just having the state pay for kids who were never going to come here anyway." "The vast majority of the people who qualify for the Choice Scholarships were already here," he assured his Fort Wayne parishioners after the voucher program expanded. "So it's not necessarily the case that we're getting tons of new students. But it's that a lot of the students are here." Fort Wayne is a microcosm of what's happening statewide, with tens of millions of state taxpayer dollars paying for children to attend private schools without, as then-Gov. Daniels had suggested, giving public schools "first shot." Behning, the law's tireless defender, argues that all parents deserve to choose their child's school, even those who have traditionally opted out of the public system. "The intent of the program was to give parents choice," says Behning. The parents of children in private schools, he says, "are taxpayers just like the parents in a traditional public school." This shift in the program's rules, begun by Pence in 2013, has led to a shift in student demographics as well. White voucher students are up from 46 percent that first year to 60 percent today, and the share of black students has dropped from 24 percent to 12 percent. Recipients are also increasingly suburban and middle class. A third of students do not qualify for free or reduced-price meals. While the program was once premised on giving low-income, public school families access to better schools, this year fewer than 1 percent of voucher students used a pathway, written into the law, that's meant specifically for students leaving failing schools. "When you look at that trend data, it is alarming," says Jennifer McCormick, the state's new Republican superintendent of public instruction, and a former public school teacher. She says of the old narrative that vouchers were largely meant to help low-income students escape underperforming public schools: "That's not necessarily the case" today. Kayla Massy-Charles fits the old narrative. And she believes that the voucher she has been using for three years has provided a bridge to new possibilities. Kayla lives with her mother, Pauline Massy, in an apartment on the outskirts of Indianapolis. She attended public elementary and middle schools and wanted to stay in the system for high school, where she could join her neighborhood friends in show choir and color guard. They live near a public high school, but it received a C rating from the state and serves more than 2,300 students. That was a problem for Kayla's mother. "Me being from the Caribbean, I really have a hard time with big," Pauline says, sitting next to her daughter on their couch. She leans into the last word. "You know, everything big." Pauline, who now works in nursing, attended a crowded public high school herself in Brooklyn, and she worried that Kayla, despite being a good student, would get lost in the crowd. So she attended an open house at a small, Catholic school nearly an hour away. For a decade, Providence Cristo Rey has been housed in an old, public elementary school building near downtown Indianapolis. The wood floors creak, and the old water fountains hang at a first-grader's height. It's part of the national Cristo Rey Network, a chain of 32 private, Catholic high schools that serve low-income, minority students. In the case of Providence Cristo Rey, three-quarters of those students are not Catholic. Pauline was impressed by the school's intimacy; it's one-tenth the size of Kayla's would-be public high school. It also has a better rating from the state, a B. She loved its emphasis on service and college completion and the fact that the school forges partnerships with local businesses and nonprofits to give students real-world work experience. Annual tuition in excess of $13,000 made the school seem out of reach, but, with a state voucher and much of the rest of the cost covered by the school's unique work-study program, Pauline was told she could enroll Kayla for just $20 a month. She was convinced. Kayla was not. She fought her mother over the move, calling other family members and begging them to change Pauline's mind. It didn't work. Because the school is an hour-long bus ride away, Kayla needs to wake up early each morning. And that, she says, requires seven alarms: 5:30, 5:40, 5:45, 5:50, 5:55, 6. "And then 6:10 is my mom's phone call," she says through braces and a broad, infectious smile. Pauline calls from the other bedroom, just across the hall. "We don't even talk," Kayla says. "I see her picture pop up on my phone, and I'm like, 'Man, it's 6:10 already?' But I do wake up." By 6:30, the 16-year-old is at the bus stop, ready for the long ride to a school her mother could not afford without the state's voucher. "You could have dreamed of this opportunity but just never have it," Pauline says. After three years of this, Kayla says she's happy and grateful for the move to private school. As proof, she points out that she is now a student ambassador for Providence Cristo Rey and knows just what to say to prospective students who seem as wary as she once was. "I didn't think I would like a small school, but I like how everyone knows everybody," says Kayla, now a junior. "You're more open. You're more able to relate to somebody and have a one-on-one connection with them than if you went to a bigger school." Kayla is studying business and ultimately hopes to start her own hair salon. If either mother or daughter has regrets now, it's Pauline. She says she was a passionate booster of Kayla's public schools and hated to withdraw her. "I believe in the public school system," says Pauline. "But now I have to worry about my child. And that might be selfish. It feels selfish on some days when I think about it. But I have to do what will get her to where she needs to be." It should come as no surprise that vouchers have become a cornerstone of Providence Cristo Rey's finances. Unlike many voucher-accepting private schools, it focuses on low-income, minority students with college ambitions. Nearly every student there receives a voucher. As a result, 31 percent of the school's total receipts last year came from vouchers, according to its annual report. This year it received $1.4 million from the Choice Scholarship program. But vouchers have also had an important effect on more traditional private schools — and more affluent ones. Roncalli High School, on the opposite side of Indianapolis, is named for Pope John XXIII (born Angelo Roncalli) and receives close to $1 million a year from the Archdiocese of Indianapolis. Its manicured campus includes a fine arts building and a gleaming stadium for its football team, the Rebels. Roncalli, which received an A rating from the state, currently enrolls roughly 1,200 students. One in five qualifies for free or reduced-price meals. "The overwhelming majority [of students] are middle class, suburban — I call 'em good, suburban rats," says Chuck Weisenbach, who has been Roncalli's principal for 22 years. He repeats the line with a smile, making clear he means it affectionately. "You know, they're just middle class, suburban rats." Weisenbach says he fully supports the voucher program. Echoing Daniels, he believes giving low-income families access to high-quality schools like his is "one of the greatest social justice issues our country's facing — because we know education is also proven to be the most consistent avenue out of poverty." While nearly every student at Providence Cristo Rey receives a voucher, a far smaller share of Roncalli students qualify: 30 percent. Still, given the larger size of Roncalli's student body, that adds up to about $1.5 million this year. And that money has allowed the school to scale back the financial aid it offers. 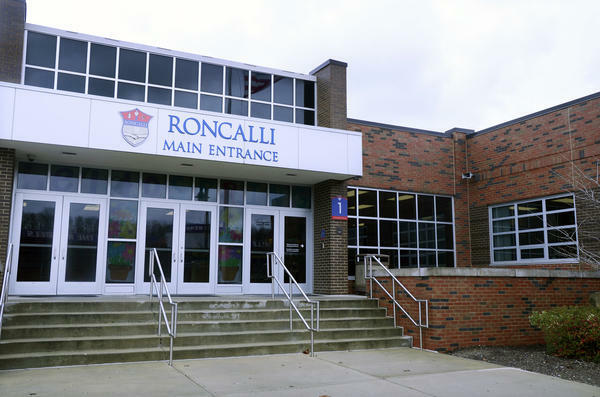 According to the school's vice president of finance, Dave Gervasio, the year before vouchers came along, Roncalli provided students with roughly $870,000 in financial assistance. For next year, it's budgeted to provide $420,000. As a result of that $450,000 savings, Gervasio says, they've been able to put more money into teacher salaries, classroom technology and a special emergency fund in case the voucher program ends someday. Today, roughly 40 percent of all private school students in Indiana receive a state voucher. The program has allowed many financially stable schools, like Roncalli, to save and invest elsewhere. For schools that were financially strapped — and, with Catholic school enrollment plunging in recent years, there are many of those — vouchers have been a lifeline, not just in Indiana but also in Milwaukee, home to the nation's oldest voucher program. In a recent study of Milwaukee's program, researchers found "vouchers are now a dominant source of funding for many churches" and that parishes "running voucher-accepting schools get more revenue from vouchers than from worshipers." Also, it's important to consider not just where the money is going in Indiana's voucher program but where it's coming from: a state education budget that, because of its unusual dependence on sales tax, has never fully recovered from the Great Recession. According to Indiana University's Center for Evaluation and Education Policy, Indiana spends less per pupil, after adjusting for inflation, than it did in 2009. Meanwhile, it's spending $146 million on private school vouchers this school year — compared to a projected $6.8 billion in its public schools. Rep. Behning points out that the state spends less on a voucher student than it would if that student were in a public school. What's left, he says, particularly the money a district raises locally through property taxes, "stays in the public school system." But, in Indiana, most of a school's day-to-day classroom funding comes from the state. Local money is generally limited to covering things like building maintenance, debt and transportation. Those are not incidental costs, but when a public school loses a student to the voucher program, it loses thousands of dollars that help pay for teachers and classroom costs. The state has also created so much new demand for limited resources that, last summer, its Department of Education, then under Democratic control, released a report that Republican lawmakers dispute. It suggested that in subsidizing so many students who had never attended public school, the voucher program had actually created a $53 million deficit. In the early years of the program "there was a small savings" to the state, says Molly Stewart, a researcher at CEEP. "But the last two or three years, since they expanded the pathways, it's been in the negative $50 million range — more state money going to education costs." The state requires little financial transparency from private schools that benefit from vouchers, and, in rare cases, the lack of oversight has allowed them to mismanage state funds. In 2015-2016, a small, private Indianapolis school was approved to continue receiving voucher payments despite an investigation by the state attorney general's office and multiple lawsuits alleging it had not paid teachers and defaulted on loans. And in 2014, 80 Catholic schools returned $3.9 million to the state after a financial review by the Indiana dioceses found errors in calculating the cost of voucher scholarships. They cited "misinterpreted complex guidelines" for the errors that were not uncovered by the state. Lawmakers also scuttled a recent effort to require voucher-accepting private schools to submit annual financial reports, in part because of Behning's opposition. "I look at voucher schools, when it comes to financial issues, in a very similar way that I think the state should look at any vendor we do business with," Behning told the IndyStar. "If we receive services, we should give them a payment. How they handle that payment, as long as they're not doing something illegal, is not in the state's jurisdiction." Robert Enlow believes there's a double standard at the bottom of this transparency debate. "I will argue that voucher-receiving schools are far more transparent [than public schools]," says Enlow, the president and CEO of EdChoice, a school choice advocacy group. He calls the Choice Scholarship program "rigorously accountable" and complains that "just getting a cost-benefit statement from a traditional public school district is impossible." Enlow also points out that, when it comes to academic accountability, Indiana stands out among voucher states. Its voucher-accepting private schools are accredited and required to administer the state test. They must also submit to the state's A-F system, which grades schools based on various benchmarks, including test scores and graduation rates. Private schools can even be prevented from accepting new voucher students if they receive a D or F rating for two consecutive years, though lawmakers recently agreed to let these struggling schools apply for a waiver that would allow them to continue. Unlike voucher programs in some other states, participating private schools in Indiana have the freedom to do what they've always done: admit or reject students based on their own guidelines, even if those students are using taxpayer-funded vouchers. Behning defends that decision, saying it was important that schools retain their ability to be selective. "The one reason we let schools have some admissions criteria is we did not want to change the very fiber of those schools." A spokesperson for the Indiana Department of Education, Adam Baker, says "a private school can deny a student based on past academic performance or prior disciplinary action," among other criteria. Some schools post GPA requirements on their websites. Struggling students need not apply. Ditto students with a suspension. This has raised fears among the state's public school leaders that private schools are cherry-picking. "Anecdotally, yes, we hear that schools can cherry-pick," Baker says, but he insists that the state has "never received a formal complaint from a parent." Behning's "fiber" isn't limited to academic performance or behavior. Some private schools also require parents to certify that they are members of the church that manages the school or to sign a statement of faith. In its online admissions packet, Lighthouse Christian Academy in Bloomington lays out its expectations of students. It lists "behaviors prohibited in the Bible" to include "homosexual or bisexual activity or any form of sexual immorality" and "practicing alternate gender identity or any other identity or behavior that violates God's ordained distinctions between the two sexes, male and female." The school then makes clear that, "in situations in which the home life violates these standards, LCA reserves the right, within its sole discretion, to refuse admission of an applicant or to discontinue enrollment of a student." Lighthouse received $665,400 in state voucher dollars this year. The 2011 voucher law prohibited the state from regulating "curriculum content, religious instruction or activities, classroom teaching, teacher and staff hiring requirements, and other activities carried out by the eligible school." When it comes to selectivity, private schools in Indiana enjoy considerable freedom — so much, in fact, that it might be more instructive to ask: For what reasons can they not deny a student admission? Baker, the Department of Education spokesman, says private schools "cannot deny children based on race, color, national origin or disability" in accordance with state civil rights law. Yet there is evidence that these protections are limited and open to interpretation. "They do not have the resources to support the child"
Just outside the Indianapolis city limits, Carol Crawn sits at her breakfast table scrolling through Facebook. Behind her, in the living room, the Today show plays quietly on a television over the fireplace. Her 12-year-old daughter, who is on the autism spectrum, sleeps quietly on the sofa, her hair an explosion of ringlets. Crawn is a special education teacher by training and an advocate for people just like her — parents of children with disabilities who are trying to navigate a state education system that doesn't always have their child's interests in mind. Case in point: Crawn points out a recent Facebook thread among a community of Indianapolis parents. It begins: "How do school vouchers work?" "I'm not clear on the details," says one commenter, "but I do know that private schools do not have to provide accommodations for students with special needs." This, says Crawn, is a common concern among parents of students with disabilities. They're not sure why the system isn't working for their children, but they're sure it isn't working. A part-time advocate with Family Voices Indiana, Crawn tries to connect these parents with resources. When she first noticed the Facebook thread, she posted, in part: "What happens in private schools frequently [is that they] will not accept a child with a disability into their school because they do not have the resources to support the child." Crawn knows firsthand, even though her family does not qualify for a voucher. "I had asked for an in-face meeting to discuss options, and they refused," Crawn says of one private school where she had tried to enroll her daughter. The school rebuffed her after seeing her daughter's Individualized Education Program, or IEP, a public school document that outlines a student's special needs. "They said, 'Send us her IEP via email,'" Crawn remembers. "And then they said, 'No, we're not equipped to handle her.'" Some schools, like Roncalli High, the Catholic school in Indianapolis, do have the resources and are more inclusive. Among its offerings for special-needs students is what Principal Chuck Weisenbach calls its Life Academy. The program includes academics, work study and time spent in a mock apartment where students cook for themselves, budget and do their own laundry. But it's a very different story at Kayla Massy-Charles' private school, Providence Cristo Rey. "Public schools can work with a special ed. kid and provide wraparound services because they receive [extra] dollars from the state," says Emil Ekiyor, a school spokesman. "Well, we don't receive that so, if we take that student, we'd be doing an injustice to that family because we just can't provide all the services they need." According to state data, Providence Cristo Rey did not enroll a single student this year who requires special education services. "Liberty Christian School may not possess the resources to provide for students who have ... a physical handicap, which would impair the learning process under normal educational conditions" or "a learning disability for which our program is not staffed." This year, 8 percent of Liberty Christian's 521 K-12 students receive special education services. That's higher than many voucher-accepting private schools but well below the state average, 14.5 percent. This is key to understanding Indiana's voucher program. Public schools are required to accept all students, regardless of disability. Voucher schools are not. In many cases, it's not the students who choose the schools but the schools that choose the students. "That is discrimination," says Robinson, the Fort Wayne superintendent. What does the law say? Most students are protected from school discrimination by the federal Americans with Disabilities Act. But private, religious schools are exempt from the ADA, and most voucher schools in Indiana are religious. Voucher schools argue that they're not discriminating; they're simply being honest. And the state appears to agree with them. The Indiana Department of Education says it encourages these schools to be upfront with families about their limitations. If they don't believe they can serve a student with special needs, they should say that. The parent doesn't have to choose that school. When NPR pointed out that some private schools are, indeed, discouraging and even turning away special education students, the department said it has never received a formal parent complaint of discrimination. Baker, the Department of Education spokesman, wants to be clear, though: The state's new, Republican superintendent, Jennifer McCormick, would like to see change. Her administration believes any school "that receives public dollars should be held to the same standard. We've made that known," Baker says. "Unfortunately, that's not in our hands to make that change. That's a legislative decision." In other words, lawmakers created the program. Only they can change it. "Just look at the records. The gen. ed student is in a private, parochial school. The special ed student's [in public school]." In Fort Wayne, Robinson is right: Students who receive special education services are much more likely to attend public schools, where federal law guarantees they will get a free, appropriate education. More than 15 percent of the city's public school students are considered special education. But the average special education rate at private schools now being used by Fort Wayne voucher students is less than half that, 6.5 percent. And Fort Wayne is the rule, not the exception. Seventeen percent of public school students in Indianapolis receive special education. In private, voucher schools used by Indianapolis students, the rate is 7 percent. It's the same story in Evansville (16 percent in public schools vs. 7.5 percent in voucher schools) and Gary (14.5 percent vs. 3.5 percent) and, in fact, most other school districts across the state. It's easy to forget that these data are built of human stories, like Ashley's. She's a mother in the Indianapolis area who used vouchers to enroll her two daughters in a local, private school affiliated with their church. "Without the voucher," Ashley says sitting at her kitchen table, "we wouldn't have been able to do that. And we're really grateful that we had that choice." Her 8-year-old son, Isaac, who is on the autism spectrum, giggles in the other room. He loves being tickled by a visiting therapist who specializes in what's known as applied behavior analysis. Out of concern for her children's privacy — and because Ashley wants to maintain a cordial relationship with her church and daughters' school — we are using her first name only. Ashley hoped that Isaac could attend private school alongside his sisters, and she reached out to the principal of her daughters' school. "But [the principal] didn't feel that she could offer Isaac what he needed, and so that was kind of, uh, where that stopped," she says, clearly hurt but also not wanting to hurt the school her daughters love. "I think every special-needs parent goes through periods of grieving, sometimes when your expectations don't meet reality. Or you don't have the opportunities that you had hoped to have for your child. And I think, in my mind, I had a very optimistic view of him being alongside his sisters." "I don't think there's any question that private school choice programs are not set up to take students with disabilities," says Julie Wright Halbert, legislative counsel for the Council of the Great City Schools. "And I think it's extremely concerning." "Many of us see this as the potential for turning our public schools into warehouses for the most challenging kids with disabilities or other kinds of particular issues," said Democratic Sen. Maggie Hassan of New Hampshire, whose son has cerebral palsy. Enlow, of EdChoice, argues that the way Indiana funds its voucher program, giving private schools less money per student than it gives to public schools, makes it difficult for voucher schools to serve high-need students. "If we're really talking about equity here," Enlow says, "we're actually saying that you should fund a kid based on what they need, not worry about what school it is." He also questions the expectation that every school be able to serve every child. "One size fits all doesn't actually fit anyone," Enlow says. "We need to have a fairly honest conversation about how do we serve all kids at the school that serves them best — not, how does every single school serve all kids." To understand school choice in Indiana, it's also important to look where choice isn't available. In central Indiana sits the small, rural town of Eminence. It's home to a gas station and convenience store where farmers gather each morning for coffee and conversation, a post office, bank and Indiana's fifth-smallest school district. Here, life revolves around the district's only school. "Everything starts at the school," says Sarah Finney, Eminence Community Schools' PTO president. "We have community events there. People who can't afford to have funerals, have funerals there." Memorials to former students ornament the school's walls. 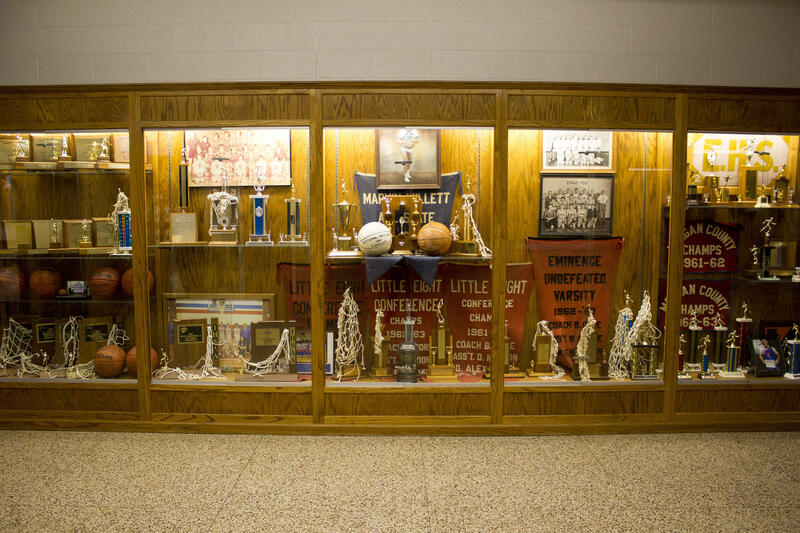 A cabinet packed with basketball trophies sits across from class photos dating back to 1901. Finney always planned for her sons, ages 5 and 8, to attend the one-building district with about 375 students, from pre-K through 12th grade. Her husband's family has for generations. "Our kids know everybody," Finney says. "The parents know everybody." While much of the state focuses on private school choice, this tiny district fights its own battles. Chief among them? Enrollment. About 1 in 6 students has left in the past five years. When an Eminence student leaves, so does roughly $6,870 in state funding. Officials say a recent property tax hike, grants and a new tuition-based pre-K program have kept them from going in the red. Yet dropping enrollment can't be chalked up to private school choice, like elsewhere in the state. There are no private schools nearby. "I've never come across one family looking for a voucher for private," says Corey Scott, Eminence principal. "Most of them are in this community just trying to stay afloat." It's a common sentiment across rural Indiana. Small populations mean few private schools — and little incentive for new ones to open. The closest private schools that accept vouchers are a 40-minute drive from Eminence. Pushes from state and national politicians for private school choice aren't relevant to the area, Scott says. "To be completely honest, I just ignore everything they say and do," she says. "They're going to make decisions regardless of anything that we have to say." Indiana lets students hop borders to attend other public schools. That has created some problems for Eminence, a C-rated district, though students aren't leaving because of academics. According to several school officials, the main reason parents cite for leaving is sports. Eminence is too small to field a football team. "What do you do with the rest of us?" While it's clear that many children have been left out of Indiana's voucher program — because of geography, grades or special needs — 34,000 students are now enrolled. For them, it's important to ask: Are they better off academically? Researchers Mark Berends of Notre Dame and R. Joseph Waddington of the University of Kentucky have spent years studying Indiana's voucher program and its impact. While they've not yet released their statewide results, they have published a narrower view — of Indianapolis kids in grades 3-8. Students in Indianapolis who left public schools to attend private Catholic schools, for example, experienced no benefit in reading but "moderate and statistically significant average annual losses in mathematics compared with the gains they experienced while attending traditional public schools," the report says. Berends adds that's "roughly like students moving from the 50th percentile down to about the 44th percentile" in math. And, he says, that's the effect over the course of one year. "So, if this continues over multiple years," Berends warns, "you can see that that's a pretty dramatic drop in achievement. By analyzing additional years, we'll be able to see if further losses occur or not." While it's not yet clear whether students performed similarly statewide, Berends says his Indianapolis results are consistent with studies of voucher programs in Louisiana and Ohio. A new review of the only federally funded voucher program in the country, in Washington, D.C., also found academic declines among students who used a voucher to attend a private school. In 2015, Dennis Epple, a professor of economics at Carnegie Mellon University, helped lead a bird's eye survey of voucher research. Of the "tightest" studies he reviewed, "the evidence from those studies with respect to achievement is something of a disappointment for people who are strong proponents of vouchers," Epple says. "Overall, the achievement effects ... were limited. There is some evidence that African-American students benefit from vouchers, but that evidence is quite limited and not robust." As a result, Epple and his fellow researchers wrote that, while vouchers appeared to improve outcomes for some students in some settings, "the empirical research on small scale programs does not suggest that awarding students a voucher is a systematically reliable way to improve educational outcomes." A 2017 review from the left-leaning Economic Policy Institute came to a similar conclusion. Martin Carnoy of Stanford University writes, "extensive research on educational vouchers in the United States over the past 25 years shows that gains in student achievement are at best small." One small, potential benefit from vouchers has shown up in multiple studies: a bump in public schools' performance as they compete with private schools. "That is one of the more robust effects," says Epple. "Competition improves the performance of the public schools that are most closely threatened, for want of a better word, by the voucher program." Epple points to public school improvement in Florida and Milwaukee. Researchers found similar evidence of a bump in Ohio. Ironically, this suggests that one of the most consistent benefits of vouchers is enjoyed by students who choose not to use them. "I think Indiana is in an interesting situation right now," says Jennifer McCormick, the state superintendent. "Because we have six years that we've had the program. Our charge right now is, what is that next step?" Her answer: Review the program and whether it's a wise use of taxpayer dollars. "You know, we're spending roughly $146 million on a program and not really reviewing it," McCormick says. "That is irresponsible." Superintendent Wendy Robinson, in Fort Wayne, doesn't need a review. She is emphatic that vouchers are "an assault on public education." The program's architect, Rep. Behning, pleads patience. Six years, he argues, is still not enough time to judge the state's school choice experiment. What's more, student performance is just one measure of vouchers' success or failure, Behning says. "Parents choose for a variety of reasons. It's not always academics ... I think the best judgment is parental choice." In other words, for the program's defenders, choice isn't just the vehicle, it's the destination. An EdChoice survey of voucher parents, conducted last summer, is instructive. Among the top-five reasons parents cited for enrolling their child in a private school, "better academics" ranked second, not first. At the top of the list was "religious environment/instruction." "It is not the government's responsibility to tell me where to educate my children," says Weisenbach, principal of the private Roncalli High in Indianapolis. "That's not only my right, it's my duty. And I shouldn't have the government telling me based on some random, geographic location that I have to go to this public high school." And Behning argues that the program can be judged a failure — or unnecessary — when parents stop choosing to use vouchers to leave the state's public schools. The problem with that standard is that more than half of this year's voucher class didn't leave a public school — because they've never attended one. What Gov. Mitch Daniels said in 2011, that "public schools will get first shot at every child," is simply not true anymore. And this gets to the question at the heart of the debate over school choice in Fort Wayne, Indianapolis, Eminence and nationwide. What is the purpose? If it's to give parents more options, then Indiana can check that box. After all, 34,000 students are now using the voucher program. If the purpose is to help low-income children find schools where they're more likely to learn, grow and succeed, that's happening for some of those 34,000, to be sure. Just ask Kayla Massy-Charles. But research suggests that vouchers may also be doing more harm than good for many students — and are not opening doors for children with expensive special needs or low grades or who don't have parents like Pauline Massy to make sure they catch the bus every morning and finish their homework every night. As the nation looks to Indiana as one model for private school choice, one thing is clear: Choice is in the eye of the beholder. 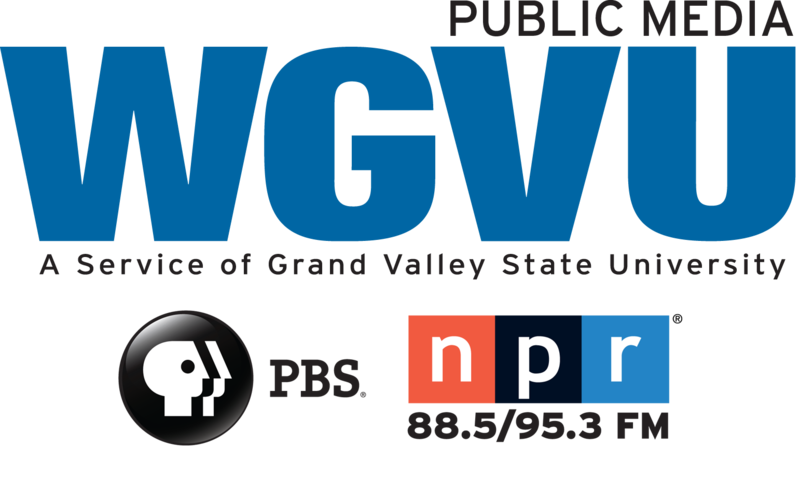 Peter Balonon-Rosen covers education for Indiana Public Broadcasting. Eric Weddle reports for WFYI Public Media in Indianapolis. President Donald Trump has called education the, quote, "civil rights issue of our time." And he believes school choice can level the playing field. PRESIDENT DONALD TRUMP: I am calling upon members of both parties to pass an education bill that funds school choice for disadvantaged youth, including millions of African-American and Latino children. MARTIN: One way to give parents more choices is with something called a private school voucher. This week, the NPR Ed team is going to explore this big controversial idea, and they're going to do it by taking us to three states that already use vouchers. Joining us to kick things off is Cory Turner from the NPR Ed team. CORY TURNER, BYLINE: Hey, Rachel. MARTIN: Let's start with a primer. Remind us how vouchers work. TURNER: Sure. So a traditional voucher program lets families take the money that a state would have otherwise spent on their child in a public school and then spend it in the private school of their choice. And this idea, as we said, is controversial really for two big reasons. First, in most traditional voucher programs, they're taking money away from public schools - and second, because parents can not only spend that money in private schools but also private religious schools. MARTIN: So vouchers have been in the courts a lot over the years. Where do they stand legally? TURNER: Yeah, so Rachel, back in 2002, the U.S. Supreme Court looked specifically at an old program in Ohio. And in a 5-4 split, the court said that that program is constitutional because it wasn't the government spending money in religious schools. It was parents choosing to spend money in religious schools. Now, we should also say, though, that most states still have what are known as Blaine Amendments, and these expressly prohibit spending public dollars in private religious schools. And that's one reason why we only see traditional voucher programs in roughly 15 states, plus Washington, D.C.
MARTIN: So where are you going to take us today? TURNER: Well, I'm going to take you, today, to the largest single statewide voucher program in the country - Indiana. Although, I'm not taking you alone. I got a big assist from two of our member station reporter friends, Eric Weddle and Peter Balonon-Rosen. This program in Indiana serves 34,000 students. And I want to play my story now starting with a cut of tape from 2011. Here's then-Governor Mitch Daniels after he signed the state's voucher bill into law. MITCH DANIELS: It means social justice has come to Indiana education. TURNER: Now, when you talk to voucher supporters in Indiana, you hear those two words - social justice - a lot. ROBERT BEHNING: School choice is a social justice issue of our time. TURNER: That's Republican State Representative Robert Behning. He's the architect of Indiana's voucher law. And it's not just the politicians. CHUCK WEISENBACH: It is one of the greatest social justice issues our country's facing and has faced. TURNER: Chuck Weisenbach is principal at a private Catholic school in Indianapolis. So the argument goes, vouchers are a way to help low-income parents get their children out of underperforming public schools - parents like Pauline Massy. PAULINE MASSY: You could have dreamt of this opportunity but just never have it, right? TURNER: Massy is a single mother who lives in an apartment on the outskirts of Indianapolis. MASSY: If you're telling a kid, always have goals, that's what Providence did. TURNER: Providence is Providence Cristo Rey, a private Catholic school near downtown Indianapolis. Three years ago, Pauline's daughter, Kayla, was in public middle school. She wanted to attend the nearby public high school with her friends, but Pauline knew that school had gotten a low rating from the state. And it serves 2,300 students. Providence Cristo Rey, on the other hand, is much smaller and better rated. When officials told Pauline that, thanks in part to the state voucher, Kayla could attend for $20 a month, she was sold. 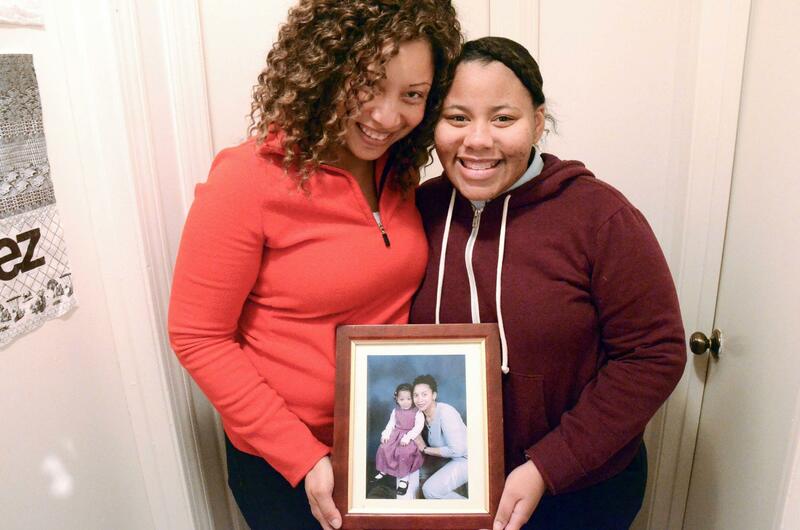 At first, it was hard for Kayla, who's now 16. She has to get up really early. KAYLA: My first alarm goes off at 5:30. TURNER: See, Providence Cristo Rey is an hour bus ride away. To make sure she gets out on time, Kayla sets six alarms. KAYLA: And then 6:10 is my mom's phone call. TURNER: So you're at work already? KAYLA: No, she's in the other room. KAYLA: So 6:10 is her phone call to be like, now you really have to get up because it's 6:10. TURNER: Kayla is studying business, a self-described lover of numbers. Now a junior, she gushes about her Catholic school, even though she and her mother aren't Catholic. KAYLA: I didn't think I would like a small school, but I like how everyone knows everybody. You're more able to relate to somebody. TURNER: For Kayla and Pauline, vouchers gave them access to something better. Voucher advocates would call that social justice. Two hours north, in Fort Wayne, Wendy Robinson has a different word for the program. WENDY ROBINSON: I saw it as an assault on public education. TURNER: Robinson is superintendent of Indiana's largest school district. This year, the state spent $20 million on vouchers for Fort Wayne students, more than any other district. But her side of the story might surprise you. ROBINSON: We're not losing kids from our school. We're now just having the state pay for kids who were never going to come here anyway. TURNER: To understand what she means, we need actually go back a few years, to March, 2013. VICE PRESIDENT MIKE PENCE: I welcome the unanimous decision by the Indiana Supreme Court to uphold our school choice program. PENCE: Responsible ways to expand educational opportunities for all Indiana families. BEHNING: It's actually grown almost exponentially. TURNER: And that growth has brought change. In 2011, that first year, most voucher students had attended public school - 90 percent. This year, fewer than half have ever been to public school. Now Superintendent Robinson's line should make a little more sense. ROBINSON: We're now just having the state pay for kids who were never going to come here anyway. TURNER: While the voucher program still serves low-income kids, a third no longer qualify for reduced-price lunch. Data show that voucher students are also increasingly white, suburban and middle-class. What's more, roughly 40 percent of all private school students in Indiana now get vouchers at a cost of nearly $150 million this year. Does that bother Representative Behning? BEHNING: It doesn't bother me. I mean, the intent of the program was to give parents choice. TURNER: But it does bother the state's new superintendent of schools. JENNIFER MCCORMICK: It should make all of us nervous. TURNER: Like Behning, Jennifer McCormick is a Republican, but their backgrounds are very different. Behning owned a small business for years. McCormick used to be a public school teacher. MCCORMICK: How many choices do we need before all of us are trying to fight for that same pot of money and none of us are doing a lot very well because that money is getting tighter and tighter? TURNER: Now, McCormick says, it's time to review the voucher program and see if it's providing the social justice it was meant to. Cory Turner, NPR News. Transcript provided by NPR, Copyright NPR.